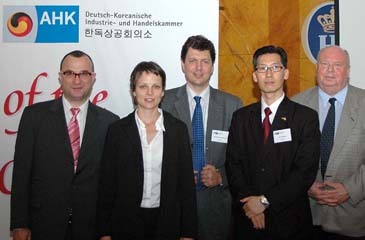 Secretary General Wolfgang Niedermark of AHK(center) with Deupty Secretary General Woo Ho-Je of AHK(2nd from right) posed and other officals. Secretary General Wolfgang Niedermark of the Korean-German Chamber of Commerce (AHK) hosted "Invest in Germany" event in celebration of 2006 FIFA World Cup Germany at Hofbrauhaus Seoul in Yeoksam-dong, Gangnam-gu on June 9, 2006. About 150 took part in the event in which Sec. Gen. Niedermark made the presentation about the conditions and environment for investing in Germany. "Invest in Germany" is the official investment promotion agency and funded by the Federal Ministry of Economics and Technology. Before the presentation Mr. Claus Auer, deputy head of mission of the German Embassy in Seoul delivered a congratulatory speech. The German government is focusing on promoting foreign investment on the occasion of the 2006 World Cup Games, which is now unfolding in Germany. German beer and dishes were served for the participants after the event. For details or inquiries please contact Miss Kim Young-Jin, information officer of AHK at 82-2-3780-4695.